The championship final will be streamed online for free at internetv.tv. Another big crowd is expected for the finale. 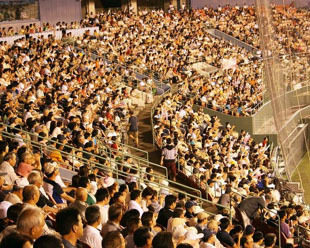 MIYAZAKI, Japan – Madonna Japan will be playing before the home crowd as the home team, after defeating USA on Saturday, 1-0, before an audience of 14,000 fans, to earn the right to begin the gold medal finale of the ENEOS Presents VI Women’s Baseball World Cup with ball-in-hand. The three-time defending champions, Japan, will come into the gold medal showdown carrying an impressive 12-game winning streak, which includes two defeats of USA -- the world No. 2, ranked just behind top-ranked Japan, according to IBAF’s World Rankings. The U.S., however, was the last country to beat Japan, back on Sunday, August 12, 2012, when the team from the Americas defeated the Asia-representative, 5-2, in an opening round-robin contest of the 2012 V Women’s Baseball World Cup in Edmonton, Canada. In Miyazaki, Madonna Japan have outscored opponents 60-2, using a .461 team batting average to power the offense. Japan’s entire lineup is dangerous. Designated hitter, Yukiko Kon, has built up a collection of 8 RBI, while left-fielder Akiko Shimura has pounded a .625 batting average en route to producing 7 RBI. Three-hole hitter/centerfielder Lori Miura has also been safe more times than out, compiling a.625 batting average, with a side dish of 7 ‘ribs’. Miura has also flashed some speed, swiping four bags. Shortstop Miki Atsugase, who has been batting second in the order, will also be a big threat in the gold medal finale, with her .545 batting average and 5 RBI inked to her 2015 World Cup curriculum vitae. On the bases, Japan has been successful in 13-of-16 stolen base attempts. The two-time former world champions and 2012 silver medalists have outscored their opponents 37-9 and are very agile with the lumber themselves, batting with a success rate of .344, but were limited to only three hits in today’s contest in which they were shutout by the reigning world champions. Catcher Kendall Dawson’s .600 batting average, 3 RBI and 3 runs scored ensures that she will likely be in the midst -- and the sparkplug -- of any U.S. offensive onslaught. First basewoman Malaika Underwood, who has batted third in the order for the U.S., takes a .333 batting average, 5 runs scored, 4 RBI and 4 stolen bases into championship Sunday. Like Dawson, Underwood will likely play a role in any chain of events that leads to run-production for USA. Right fielder/pitcher Sarah Hudek (ERA 0.00; ave .444) can potentially have a big influence on the outcome of the game, from the side of ofense and/or defense. Shortstop Jade Gortarez poses a big threat and packs a punch, batting .538. Sidekick, third baseman Michelle Snyder, like DH Tamara Holmes, is batting .308. On the base paths, USA has stolen 17 times out of 21 attempts, with Tara Harbert’s 4 SBs helping to lead the way. Japan’s pitching staff (ERA 0.00) has been very stingy on all accounts, refusing to distribute free passes (walks), and selectively handing out only seven walks in five games -- that’s compared to 22 strikeouts. Nana Sasanuma has limited her opponents’ batting average to .087, while teammate Ayami Satoh has been even more frugal, shutting down opposing offenses to a .063 batting average. Yukari Isozaki, who is often given the ball to start the game, allowed Japan’s only two runs in 2014, in a shaky start versus Canada, whose hitters struck for several hard-hit balls. Seventeen-year-old left-hander Sarah Hudek will be USA’s starting pitcher in the gold medal finale. Opponents have been limited to a .045 success rate at the plate when Hudek has been given pitching responsibilities. The young southpaw has allowed just one hit while striking out five and issuing just just one walk in her two World Cup appearances in Miyazaki. USA will have the fire-power of pitchers like Donna Williams (ERA 1.62), Clarisa Navarro (1-0) and Bessie Noll (1-0) to potentially act in relief. With the gloves in their hands, Madonna Japan have taken very good care of the ball, making just one error in 112 chances and not gifting anything to their opposition. Japan has not allowed a stolen base – opponents have only tried once, unsuccessfully, to run on Japan’s catchers. The USA squad has been solid defensively, only committing four errors in 145 attempts (.973), while only allowing 2 successful stolen bases and catching three out of the five attempted robberies. The Women’s Baseball World Cup grand finale is scheduled for Sunday, 07-September at 2:00 p.m. local time (3:00 p.m. Sydney; 07:00 a.m. Paris; 01:00 a.m. New York City, 10:00 p.m. Los Angeles).